Below, Kronborg Castle, in Elsinore, Denmark. It is a renaissance castle and a military fortress, known all over the world from Shakespeare's Hamlet. 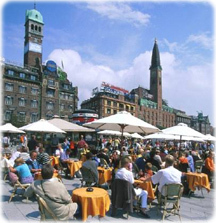 Once the seat of Viking raiders and later a major north European power, Denmark has evolved into a modern, prosperous nation that is participating in the general political and economic integration of Europe. First organized as a unified state in 10th century. In 1849 became a constitutional monarchy. It joined NATO in 1949 and the EEC (now the EU) in 1973. However, the country has opted out of certain elements of the European Union's Maastricht Treaty, including the European Economic and Monetary Union (EMU) and issues concerning certain justice and home affairs. 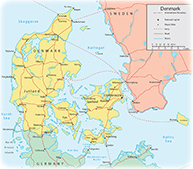 The Kingdom of Denmark, with an area of 16,639 square miles, consists of the Jutland Peninsula and roughly 500 islands. Flooding is a threat in some areas of the country (e.g., parts of Jutland, along the southern coast of the island of Lolland) that are protected from the sea by a system of dikes.